Rethinking a dress in autumn much context. No, no. This story has nothing to do with the eponymous movie directed by David Lynch. 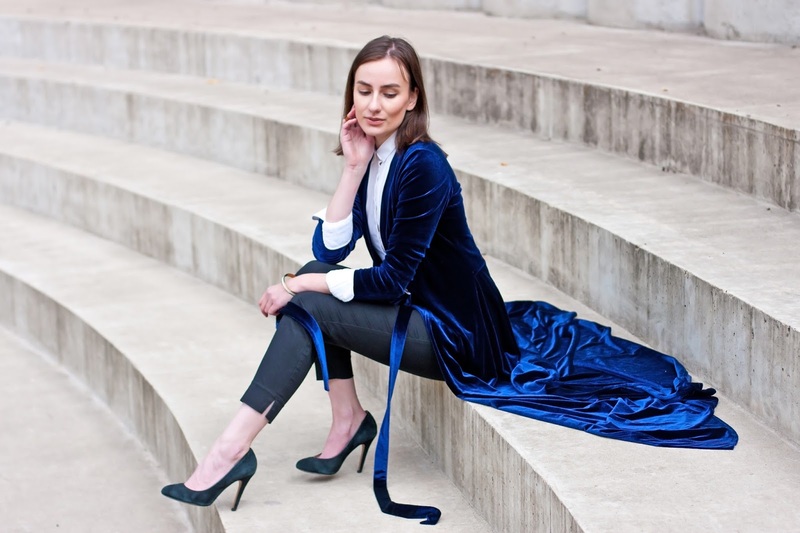 Still, I can't deny the fact that this Sl_Ira dress has something similar with the robe gorgeous Isabella Rossellini wore in a 'Blue Velvet' movie. 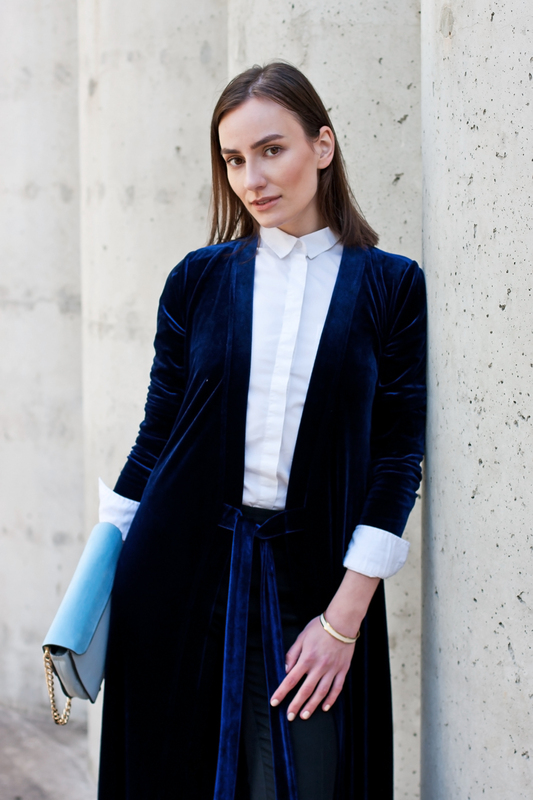 The wrap thing, the maxi length, deep blue color and velvet fabric and... that's all that unites the two dresses. And if Rossellini's gown dates back to 1980's, my piece is all about modern day version. So, speaking of the Sl_Ira dress we've already seen me wearing back in quite a special story (here), I was looking for ways to pull it again, in a pretty unexpected combination though. If such a combination can be called an unexpected one, especially these days. 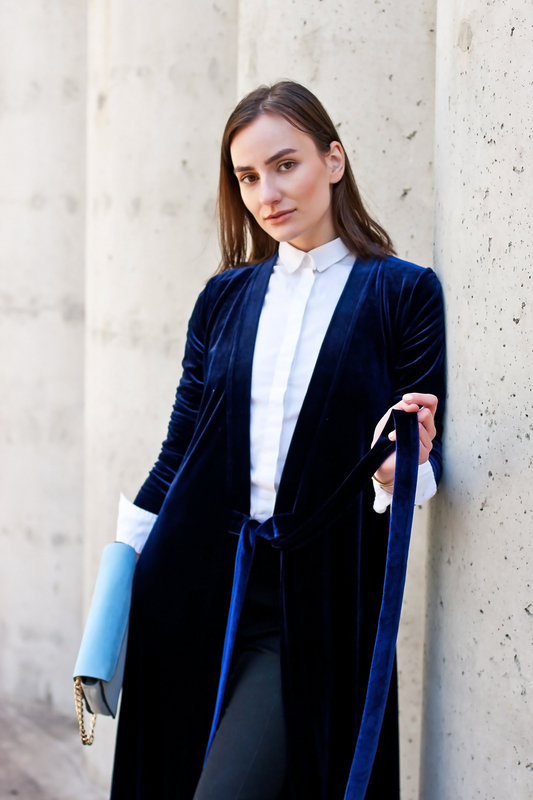 Yes, I am literally in love with this wrap dress from Ukranian label. What do I like most about it? Maybe an overall elegant style of it. Or maybe a luxurious touch that's all about timelessness. Or maybe the deep blue color I'm so obsessed with lately. 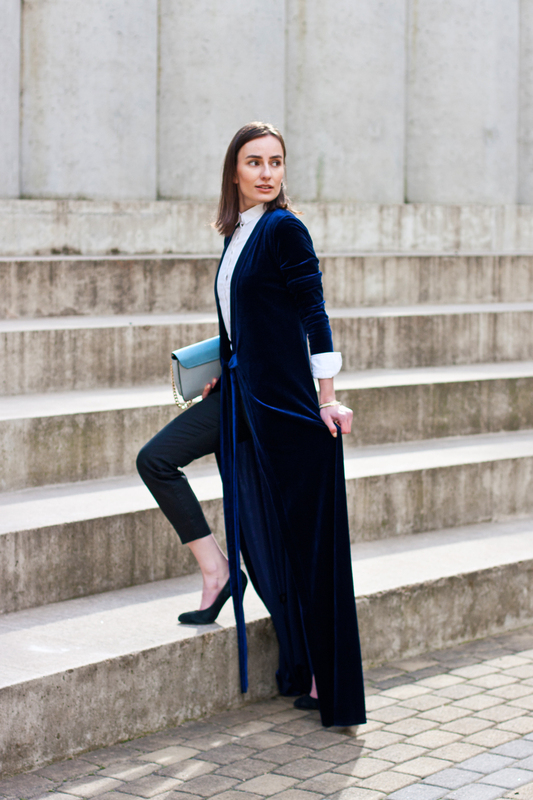 Actually, maybe it's the velvet, such a trending kind of fabric? 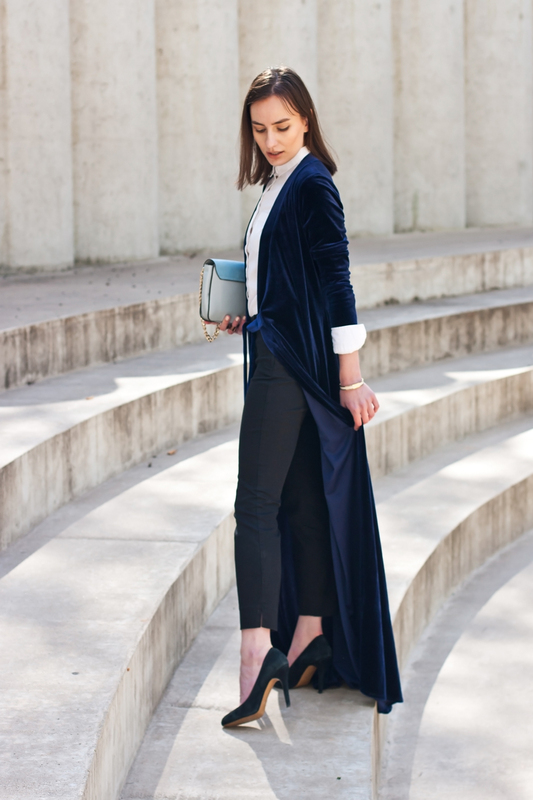 It was just in previous story that we looked close enough at velvet as one of this Autumn/Winter season's main trends. Well, today we are moving on from theory to practice, so to say. But going back to Sl_Ira dress, it's a combination of all factors described above that made me fall for this piece. And let's not forget about the wrap kind of thing that was built in a fashion cult by Diane von Furstenberg (that still remains relevant today). So how did I come to such an outfit formula? As I said above, it all started with Sl_Ira dress I was thinking of pulling in autumn season as well. Thankfully, it was just in time that various articles from a series of 'How to style your favorite dress in autumn season' and '50 coolest street style outfits to copy now' started popping up in my Facebook feed. After taking some time to drive inspiration and set myself for an autumn-much mood I thought of this exact combination. 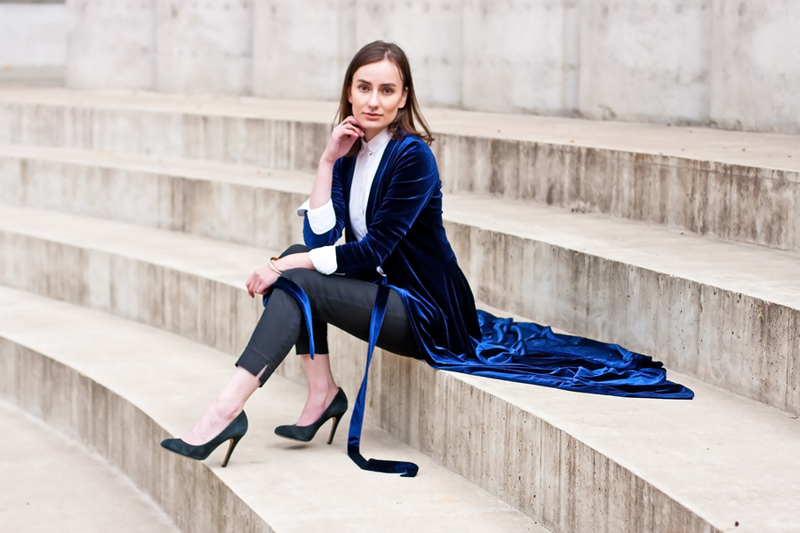 A highly simple combination of a white shirt, black pants and black court shoes that can easily be brought to a whole new level by means of a velvet wrap dress turned into a long cardigan or a blazer, or an outer piece, you name it. Easy peasy October squeezy. WOW how gorgeous is this wrap dress and the way you style it is so genius !